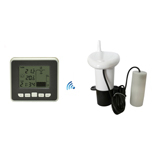 The FT0025 Ultrasonic liquid depth meter with leakage sensor is an inexpensive solution for remotely measuring levels. The sensor works by measuring the time required for an ultrasonic pulse to travel to and from a target surface. It also detects liquid leakage of the liquid tank. 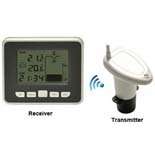 The wirelss signal transmits up to 300 feet for easy viewing in the comfort of your home on the LCD display.